Sean Chen's art desk. Photo 1 of 2. Sean Chen likes to get it right. As a top comic artist, Sean is sought after because he makes sure he gets the details right. His attention to detail draws the reader into every panel and every page. He creates a world so perfectly designed and stimulating that you become immediately immersed in the story. Sean gets it right, which means we get some amazing stories. His work on Iron Man, X-O Manowar, Wolverine is considered among the best runs of those titles. Sean was nice enough to share a few photos of his workspace and answer a few questions about how he works. Sean Chen’s art desk. Photo 1 of 2. Comic Book School: What’s one thing every artist should include in their convention portfolio? SEAN CHEN: A portfolio should speak for you in terms of what your artistic intentions are. So often when I review portfolios, I see a new artist try to cast the widest net possible and include a such diversity of work. The theory being it should increase your chances of breaking in. My rule of thumb is only show off the skills that you want to end up doing, or that you have become very good at. If you want to be a penciler, then show that, and spare everyone your mediocre inks or coloring. Not to say that you shouldn’t do that other stuff, in fact, it is an important part of your artistic development, but understand that a portfolio review is a very directed assessment of skills to fill a specific job. Comic Book School: What do you look for in a script? SEAN CHEN: Usually a writer will call for a certain facial expression and/or body language to be drawn, and usually its pretty clear from the context of the story what emotions need to be conveyed. If it is not 100% obvious, It is vitally important to search the script, past scripts or back issues going back as far as necessary to completely understand the significance of the moment you are called upon to depict. Or just call the damn writer. In modern superhero comics, the stories are larger than life, with some bizarre happenings, and continuity that can go back decades, so fully understanding the significance of an emotional moment is not always so obvious. Capturing the acting of characters properly is the most important thing we are responsible for as artists. Sean Chen’s Workstation Photo 2 of 2. Comic Book School: What’s one comic book you’d recommend that people start reading? SEAN CHEN: There really is no need to recommend this book since everyone is already reading it, but Saga is great for both writing and Fiona Staple’s art. I also pick up anything done by artists I like and follow. These days I’m really into Olivier Coipel and Stuart Immonen. Comic Book School: What’s on your desk right now? SEAN CHEN: Mostly ad work. I draw storyboards for commercials. These jobs are lined up for me by my agent. Most people know that they pay better than comics. What most people don’t know is that they can be very creatively rewarding if you are the type of person that can get into it. I also do quite a bit of covers for comics, and the occasional comic book interior job. 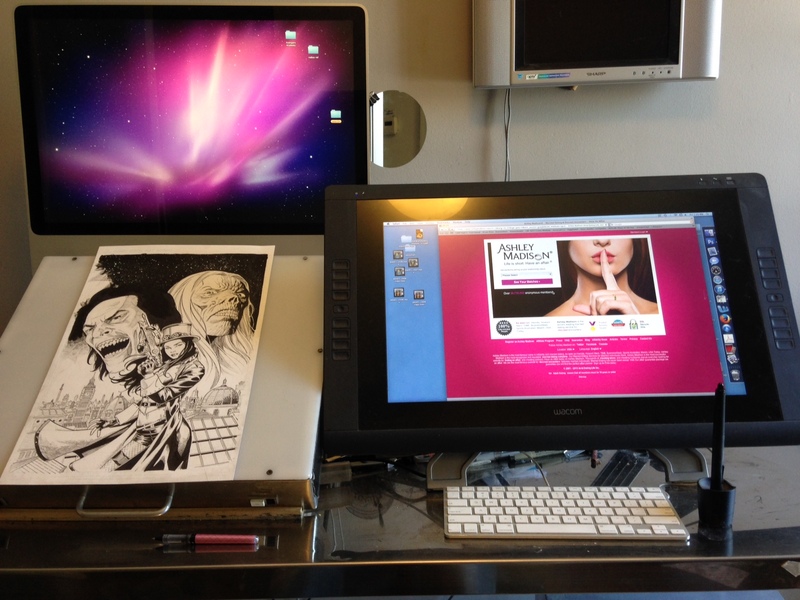 SEAN CHEN: My Wacom Cintiq 22HD in conjunction with Photoshop. I used to resist technology, but now I love what it does to my art. I still draw with pencil and ink, but everything I draw gets 10 to 20% better with some digital post manipulation. Comic Book School: Where do you work? SEAN CHEN: In the basement of my home. I renovated it so that it would be a nice place to spend the majority of my days. Comic Book School: Regular working hours? SEAN CHEN: It used to be like noon to 4 AM, but these days, my schedule has conformed to my young children’s. So its up at 6:30 AM and off to bed around midnight. I work mostly during the hours that the kids are in school or daycare. 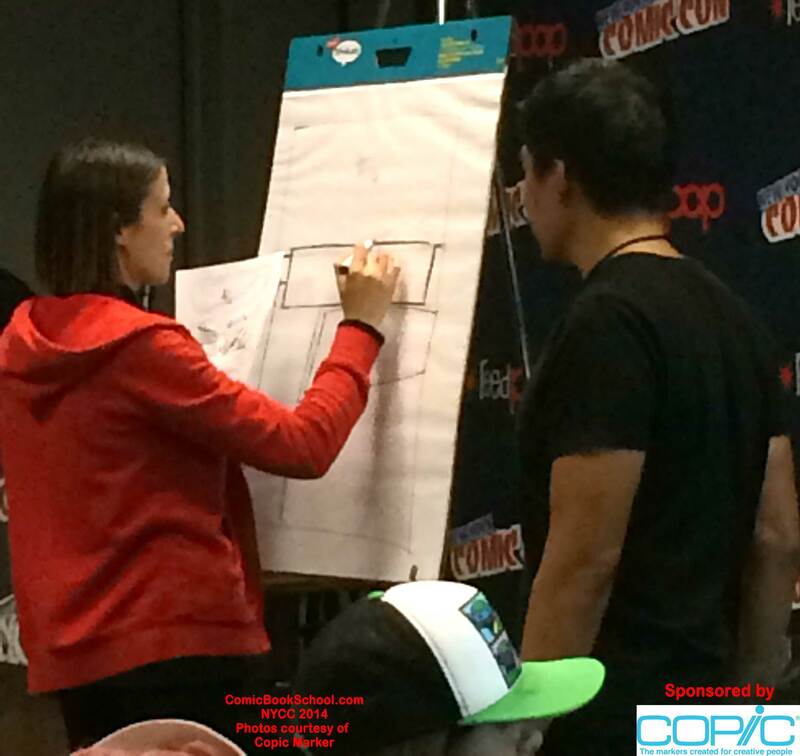 Sean Chen and Sara Pichelli working together at NYCC 2014. 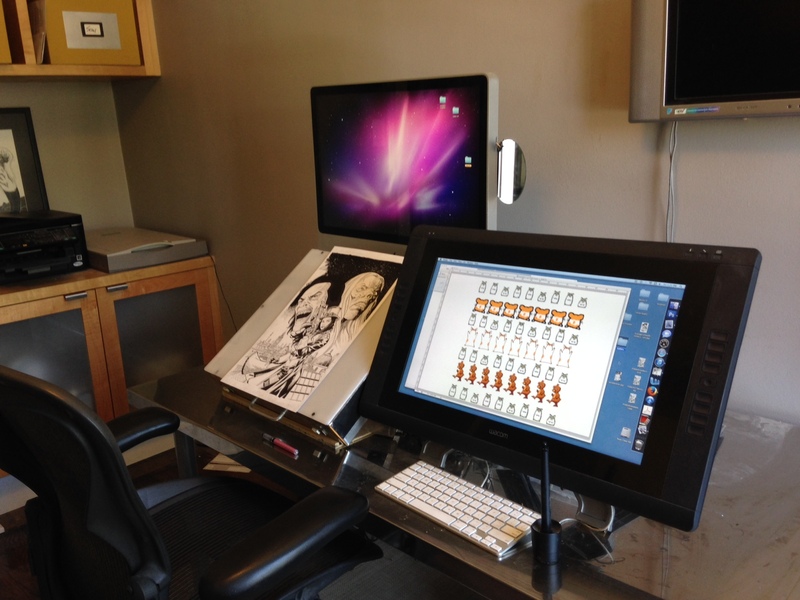 Comic Book School: Do you multitask while working? If so, what sorts of things are you doing or listening to? SEAN CHEN: I listen to podcasts mostly. Any of the shows that deal with our industry are great, such as Inkpulp Audio, Stuff Said Show with Gregg Schigiel, or Sidebarnation. Lately I’ve been working my way through Skeptoid with Brian Dunning, which is about dispelling myths and pseudoscience. Check out other creator workspaces.